ardhosting Review 2019: Is ardhosting a Good Hosting? ARDHOSTING is an Indonesian hosting company with stellar support service and a number of hosting plans that will fit anyone’s budget and needs. The company focuses on providing affordable services with loads of additional features that are not available with most of their competitors. ARDHOSTING is an Indonesian hosting agency established in the year of 2000 with a focus on providing low-cost, easy-to-use web hosting solutions to clients all over the world. The company is based in Indonesia, but their global network includes data centers in Indonesia, Singapore, and America, which allows their clients to pick their preferred server locations depending on their marketing aspirations. Their website is only available in Bahasa Indonesian at the moment. ARDHOSTING has an abundance of customizable hosting plans, along with a number of value-added applications and features. Depending on what you need, there are Linux and Windows-based SSD hosting solutions. Here, it’s important to note that their Windows-based servers are licensed, as a few hosting companies don’t include Windows licenses in their packages. Their Linux-based web hosting features a number of packages, including those that are specifically tailored for WordPress, e-commerce, and corporate purposes. This is great because it gives you the flexibility to choose hosting packages that experts have designed exclusively to fit the needs of your industry. Moreover, each of these plans comes with a full suite of well-designed third-party applications to help your website run properly and to the satisfaction of both you and your visitors. Since the company is partnered with Softaculous, they also provide the support for you to build your own website from scratch using a simple step-by-step wizard. To effectively manage your website and all your account configurations, you’ll get a free cPanel installation (or Plesk if you’re on Windows), which is one of the most popular control panel solutions on the market and has become standard issue in the industry. Further, ARDHOSTING utilizes a LiteSpeed Web Server and CloudLinux setup, ensuring far more efficient processing speeds than a typical Apache Web Server configuration. The company also provides you with free SSL certificates to keep your data and your visitors safe as well as push your Google search engine rankings up. Plus, their HTTP/2 protocol allows your webpages to load faster, so visitors don’t have to wait much to access your content. On top of that, they provide free interval backups both locally and remotely. Strangely enough, with all their talk of fast servers and highly reliable networks, ARDHOSTING does not seem to have an uptime guarantee. Indonesian Rupiah is an interesting currency, and you might be initially stunned by the numbers listed on their website. However, once you do the necessary conversions, you’ll find that they’re offering a valuable service for unusually low prices. Compared to their Indonesian competitors, their prices are a little higher than average; then again, with all the features and extras that you get, they still offer an incredible value for money. They don’t seem to offer any discounts for longer contract terms, but they do guarantee a price freeze for the duration of your contract — meaning even when you renew your hosting contract, the prices won’t go up. ARDHOSTING has a money back guarantee, but it’s unclear how long this is valid for or what the requirements are. The webpage detailing their Service-Level Agreement seems to still be under construction. If you’re moving over from another hosting provider, they offer a free website migration service — provided you were using cPanel with your previous vendor. Upgrading your package is free and can be done at any time; however, should you wish to downgrade your packages, you’ll have to pay a hefty surcharge. Support-wise, the company has really made great efforts to go the extra mile for their customers. They have 24/7 phone support available in English and Bahasa Indonesian; further, there’s also a ticketing service that provides assistance within a reasonable timeframe. On top of that, you can always contact their staff through their Facebook, Twitter, and Google+ social media channels. ARDHOSTING offers excellent service with state-of-the-art hardware and loads of extras that bring additional value to any hosting plan you decide on. The Indonesian company provides superior customer support 24/7 in multiple languages. 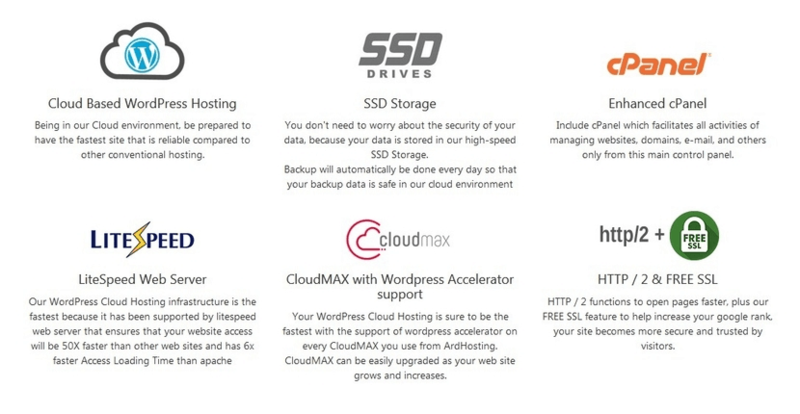 Wondering how ardhosting stacks up against other Web Hosting companies? Enter any other Web Hosting company and we will give you a side-by-side comparison.